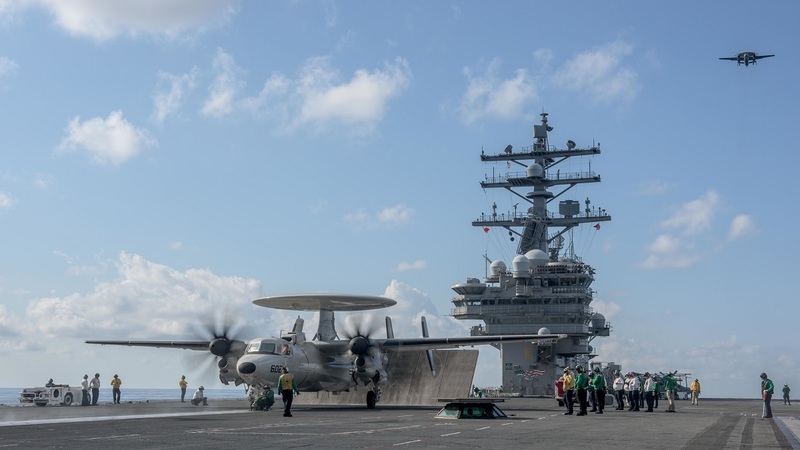 On May 22, in the Water South of Japan Carrier Air Wing 5 (CVW-5) completed carrier qualifications aboard the Navy’s forward-deployed aircraft carrier, USS Ronald Reagan (CVN 76). As explained in the article Ronald Reagan Completes Carrier Air Wing Qualifications, more than 100 pilots in more than 60 aircraft from nine squadrons based out of Naval Air Facility (NAF) Atsugi and Iwakuni, Japan, completed almost 700 events, including over 200 touch and goes and almost 500 arrested landings to qualify pilots to conduct missions as the ship begins patrol in the 7th Fleet area of operation. 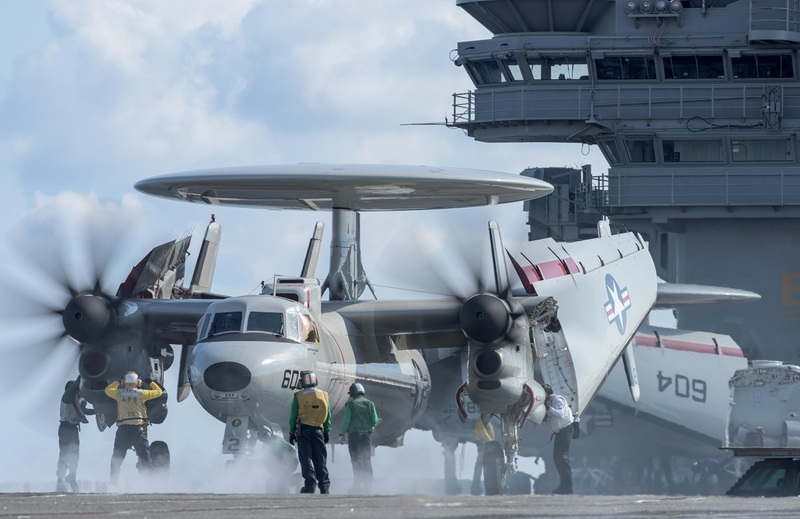 An E-2D Hawkeye, assigned to the “Tigertails” of Airborne Early Warning Squadron (VAW) 125, performs a touch-and-go on the flight deck of the Navy’s forward-deployed aircraft carrier, USS Ronald Reagan (CVN 76). Noteworthy CVW-5 mission is critical to the U.S. commitment to the peace and stability of this region. CVW-5 is the always-ready, air-combat arm of Battle Force 7th Fleet, with warfighting assets that include the F/A-18E/F Super Hornet, EA-18G Growler, C2-A Greyhound, and MH-60R/S, as well as the latest addition of the E-2D Hawkeye after the “Tigertails” of Carrier Airborne Early Warning Squadron (VAW) 125 replaced the “Liberty Bells” of VAW-115 earlier this year. “With the completion of these qualifications, I can say with confidence that USS Ronald Reagan and Carrier Air Wing Five are disciplined, well-prepared and stand ready to answer our nation’s call,” pointed Capt. Buzz Donnelly, USS Ronald Reagan commanding officer. U.S. Sailors prepare to launch an E-2D Hawkeye aircraft assigned to Airborne Early Warning Squadron (VAW) 125 from the flight deck of the aircraft carrier USS Ronald Reagan (CVN 76) in the waters south of Japan. The mission of CVW-5 is to conduct carrier air warfare operations and assist in the planning, control, coordination and integration of eight air wing squadrons in support of combat operations. Ronald Reagan and the embarked air wing provide a combat-ready force that protects and defends the collective maritime interest of the U.S. and its allies and partners in the Indo-Asia-Pacific region. Sailors prepare to launch an E-2D Hawkeye, assigned to the “Tigertails” of Airborne Early Warning Squadron (VAW) 125, from the flight deck of the Navy’s forward-deployed aircraft carrier, USS Ronald Reagan (CVN 76).